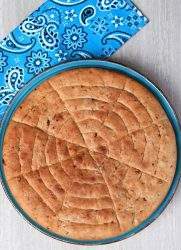 Himbasha | H'mbasha | Ambasha is an Ethiopian Flatbread, often made as a celebratory bread. It is a mildly sweet flatbread flavored with cardamom, raisin and black sesame seeds. I used my food processor to make the dough for the Himbasha. We could make it by hand or a stand mixer as well. In the bowl of the food processor or a large bowl, add the flour, instant yeast, sugar, salt, cardamom powder and black sesame seeds. Mix well to combine. Add the raisins and the oil and mix once to combine. Slowly add warm water to make a soft dough. Knead for about 7 to 10 minutes to get a soft and non-sticky dough. Cover the dough and let it rest until doubled in volume. It took me about 1 1/2 hours. Once the dough has risen, punch it down gently. Grease a 9 inch cake pan or any oven safe pan. Place the dough and spread it evenly across the pan. The dough will retract back. In that case, rest for 5 minutes and then stretch again. Cover the pan and let it rest for about 30 to 45 minutes or until the dough is puffy. Now using a blunt knife, make patterns on the dough. I made the traditional wheel pattern on mine. Brush the top with milk and bake for 25 to 35 minutes or until the Himbasha is golden brown on top. Remove from the oven and let it briefly rest on a cooling rack. Slice and serve.